An emerging body of research has dealt with tracing the historical roots of contemporary economic and political outcomes. In Besley and Reynal-Querol (2012), we investigate persistent effects of African history and investigate whether much of what we see now is historically determined and hence not easily amenable to manipulation. We focus specifically on the extent to which the post-colonial period saw a legacy from conflicts that are documented to have occurred in pre-colonial times. The importance of history was recognised long ago by two distinguished mid-20th century anthropologists of Africa, Meyer Fortes and Edward Evans-Pritchard, who remarked that “Acts of violence, oppression, revolt, civil war, and so forth, chequer the history of every African state.” (Fortes and Evans-Pritchard 1940). This sentiment is echoed by Reid (2012), who studies the history of conflict in Africa from ancient times to the present and remarks that: “The past was very much present in the organisation of violence, even during the revolutionary upheaval of the 19th century and the self-consciously modernist struggles of the mid-20th century. States and societies sought historical precedent and heroic forebears, both for inspiration and solace, and constructed both oral and written narratives … for the purpose”. To study this using statistical methods, we exploit variation between and within countries to examine the legacy of recorded conflicts in Africa in the pre-colonial period between 1400 and 1700 as recorded in a historical conflict catalogue which is increasingly being used by economists and political scientists. We geo-coded pre-colonial conflicts in Africa and created a map locating them in their contemporary countries. The figure below suggests a schematic framework for thinking why there could be an historical legacy. 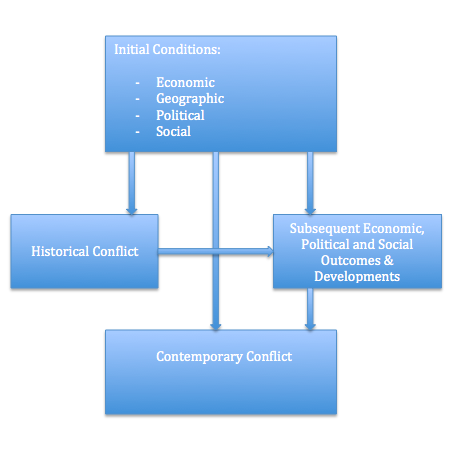 First, historical conflicts themselves have determinants in the social, political, geographic and economic context of regions at the time the conflicts took place. One of the reasons for persistent conflict may be the interaction between geography, natural resources and settlement. 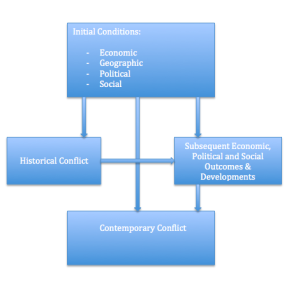 Second, conflicts can affect the evolution of subsequent economic, political and social outcomes, which have a bearing on contemporary conflict. For example historical conflicts could promote distrust among social groups, which affects attitudes and identities. They could also have an economic legacy, making regions poorer, and could also influence the choice of political institutions. Hence one can see that historical conflicts can have both a direct and indirect effect on current society. We then find robust evidence that patterns of conflict after countries in Africa gained independence are correlated with having had more historical conflicts within their borders. For each additional year of a historical conflict, we find that the country suffers an extra 0.12 years (or two months) of additional conflict in the post-independence period. This can also be investigated using sub-national data on conflicts in precise locations within countries in the period between 1997 and 2010. Here to we show that having had a historical conflict close by is positively correlated with more recent conflict. At the sub-national level, we find that historical conflict is correlated with a lower level of economic development today using data on the geographical distribution of night-time luminosity (as measured by satellites) as a proxy for economic development. Returning to the mechanism, there is evidence supporting the view that the mechanism at work may be a diminution in trust, and a weaker sense of national identity. Our results give credence to the view that having had historical conflicts reduces trust between groups as well as affecting citizens’ sense of identity. We also provide suggestive evidence that historical conflicts may play a role in shaping attitudes more than contemporary conflict, even though the latter is correlated with historical conflict. Persistent conflict may also be due to the interaction between geography, natural resources and patterns of settlement, which spawn particular institutional arrangements, although we find no evidence of a link with weak institutions at a country level. Our findings add further fuel to the idea that some phenomena that we see in the world today are, at least in part, the product of historical legacies. 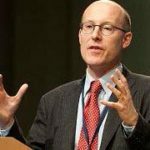 One reaction of the findings could be to create a sense of despair that much of what we see is predetermined and thus policy change can only have a limited impact on economic conditions. But that conclusion is too bleak. To the extent that there are headwinds in the face of progress, which are due to historical legacies, it is better to understand them than to ignore them. The need to embed our theories of institutional change in an understanding of social structures shaped by history opens up many possibilities for research and for providing policy advice, which is appropriately tailored to the particular circumstance in which it is given. Put differently, demonstrating that current features are historically conditioned may give insights into why some policies have heterogeneous effects in different locations. Just because historical conflict is correlated with lower levels of trust and hence a greater prevalence of post-colonial conflict does not mean that the process is deterministic, a well-targeted policy aimed to increase trust and sense of national identity across countries could be an effective way of reducing contemporary conflict. Acemoglu, D, S Johnson and J A Robinson (2001), “”The Colonial Origins of Comparative Development: An Empirical Investigation””, American Economic Review 91, pp. 1369-1401. Besley, B and M Reynal-Querol (2012), “”The Legacy of Historical Conflict Evidence from Africa,”” STICERD – Economic Organisation and Public Policy Discussion Papers Series 036, Suntory and Toyota International Centres for Economics and Related Disciplines, LSE. Fortes, M and E Evans-Pritchard (1940),“Introduction”, in Fortes and Evans-Pritchard (eds), African Political System, Oxford: Oxford University Press.